On October 5, 2017, Refugees International hosted its 15th Annual New York Circle, an event titled "A Night for Refugees." RI and its Board of Directors honored Ambassador Samantha Power, former U.S. Permanent Representative to the United Nations, with Refugees International's 2017 Exceptional Service Award. Board Member Emeritus Sam Waterston served as the evening's master of ceremonies, and Mariela Shaker, celebrated Syrian musician and refugee from Aleppo, performed. 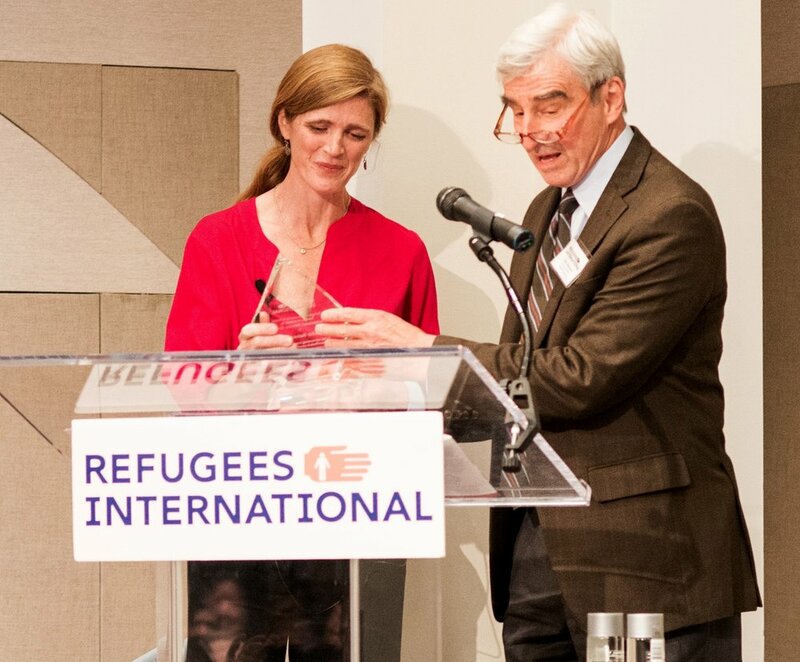 Board Member Emeritus Sam Waterston presents the 2017 Exceptional Service Award to Ambassador Samantha Power. 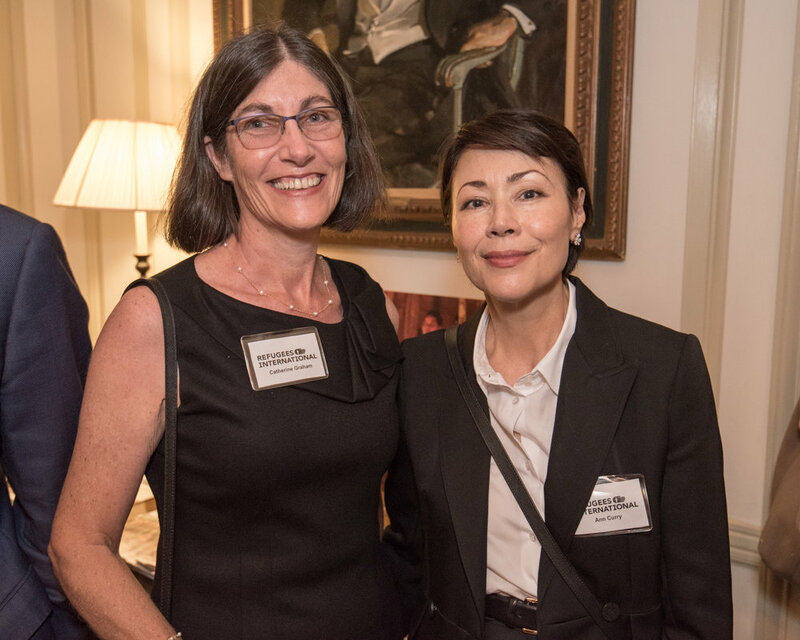 Journalist Ann Curry, a past awardee, attended the event, pictured here with guest Catherine Graham. This year, the New York Circle took place at a critical time as tens of millions of refugees have been forced to flee their homelands due to conflict, persecution, andextreme climate-related disasters, as just witnessed in the Caribbean. Disturbingly, the world is again witnessing ethnic cleansing and crimes against humanity, such as those perpetrated against the Rohingya people in Myanmar. Conflict and drought are creating famine conditions in Yemen, Nigeria, Somalia, and Sudan. These terrible events are unfolding as anti-refugee sentiment is on the rise across the world and within the United States as long-standing U.S. commitments to aiding and resettling refugees appear to be under threat. 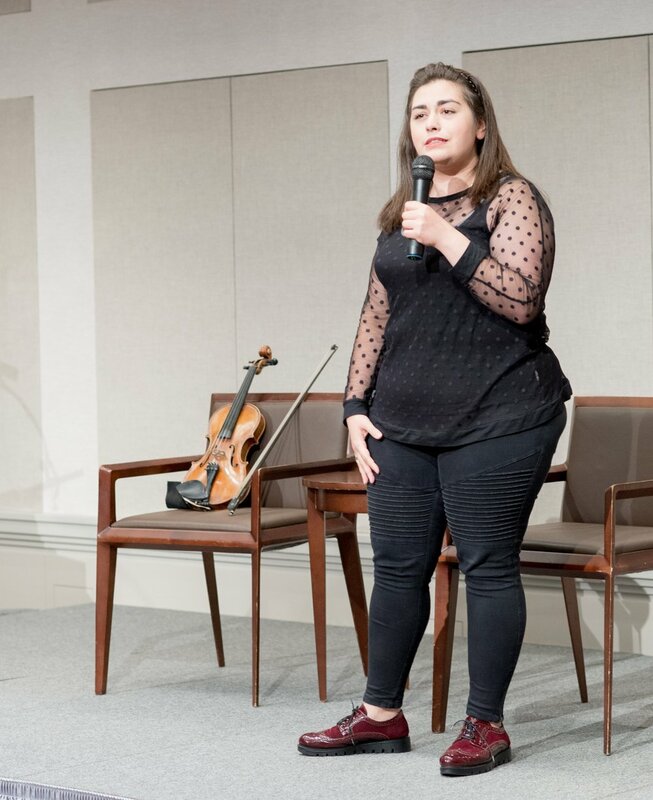 Mariela Shaker, celebrated Syrian violinist and refugee from Aleppo, performed at the event. Given these challenging times, Refugees International is committed to acknowledging those who are committed to the cause of refugees and to humanitarian values. In that spirit, RI honored Ambassador Power, an extraordinary leader on human rights and humanitarian issues, with the 2017 Exceptional Service Award. Sarah Bacon, Caroline Netchvolodoff, and Natasha Weiss served as the event's co-chairs. Heineken and L’Oreal were the evening's Visionary Sponsors, and Voss Water and the Preston Farm & Winery supported the event with generous in-kind donations. Interested in sponsoring the 2018 New York Circle? Click here for our sponsorship information form.